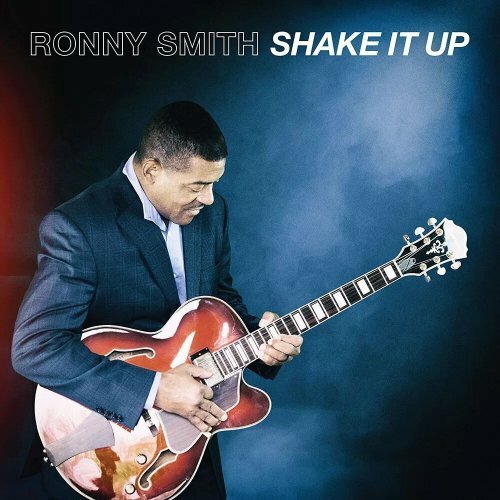 Baltimore based jazz guitarist Ronny Smith is certainly one of the most underrated guitarist in music history. Often compared with George Benson, Wes Montgomery and Joe Pass he has since long time developed his own significant style. That this unique style appeals the audience, shows the huge amount of releases like Long Time Comin (2001), Laid Back (2002), Got Groove (2006), Simply Stated (2007), Just Groovin (2009) and Can’t Stop Now (2013). Shake It Up (2017) is his essential return with a special twist. Ronny performs on his new album guitars and keys programming. Musical supporters are Conley Whitfield, Jr., Reggie Wilson (bass), Scott Martin (sax), Will Allen (drums), Stan Martin (trumpet), Andy Martin (trombone), Eddy Botts, Jeff Knoetter (keyboards), and Gerald Chavis (muted trumpet). Ronny has written all tracks, which gives a clear hint about his subtle creativity.